BEIJING: For seven years the Beijing Olympics have provided the over-arching umbrella under which Chinese authorities have sheltered while pushing through some of the most sweeping transformations of a society the world has seen. The Chinese Communist Party has officially acknowledged that even Chairman Mao was 30 percent wrong in his actions, but the Olympics have been deemed 100 percent right; to question them is the equivalent of blasphemy. Since the time of the Roman Empire, large sporting events have served an important ritualistic and political function, helping to create a sense of common belonging and pride amongst citizens. 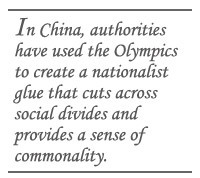 So in China, the authorities have used the Olympics to create a nationalist glue that cuts across social divides and provides a sense of commonality at a time when traditional social moorings became unhinged by vertiginous development. All of this begs the question: What will fill the Olympic-sized void once the Games end? Neither the World Expo in Shanghai nor the Guangzhou Asian Games, both scheduled for 2010, have the same rallying power to mobilize a nation. For the Chinese leadership, this is an issue that presents the need for some tightrope walking that even the skilled policy acrobatics of Beijing’s top apparatchiks will find testing. When I first moved to China in late 2002, I was somewhat befuddled by the overwhelming dominance of the Olympic Games in virtually every narrative strand I came across. Whether it was stock-market analysts, anti-tobacco lobbyists, intellectual property rights lawyers, tourist officials or foreign journalists, it was almost impossible to avoid the “O” word. Animal-rights activists talked of how the Games would transform Chinese attitudes to dogs away from viewing them as food and towards coddling them as man’s best friend. Stock-market analysts pointed to the economic buoyancy generated by the Olympics as the basis for bullish predictions, while taxi drivers grappled with English textbooks, determined to master their ABC’s in time to welcome “foreign friends” in August 2008. Over the six years that I went on to spend in the Chinese capital, Beijing was mauled by cranes and bulldozers, with large swathes of the ancient city smashed and rebuilt anew. The sparkling facades that emerged from the ashes of the old city not only sent a clear message about China’s particular vision of modernity, but in severing all physical linkages with the past, they erased the city’s collective memory. This was a phenomenon that helped sublimate the as-yet-unresolved wounds of recent history – including the emotional and physical devastation unleashed by Mao’s Cultural Revolution – while focusing attention on a future ostensibly as bright as the dazzling Bird’s Nest stadium. Hundreds of thousands of people were dislocated in the process. Some protested, but many others I spoke to accepted their lot as necessary for the “New Beijing” that the Olympics would unveil. With their promise of bringing massive “face” to the country, the Games fed the flames of nationalism with considerable success, building confidence in the Communist Party’s ability to deliver international recognition in the eyes of its domestic constituency. They also served as a powerful pretext for stilling dissent. If all the necessary accommodation, on occasion painful, to ensure a successful Olympics was deemed and accepted as patriotic, then those who questioned their value were of definition traitorous. The utility of the Olympics to the Chinese authorities was illustrated by the manner in which the Games were used to distract from and silence criticism of the shoddy construction and deep-rooted corruption revealed in the aftermath of May’s devastating earthquake in Sichuan province. In several of the cities hardest hit by the earthquake re-enactments of the Olympic Torch Relay were organized. The idea, according to local media, reports was to use “the Olympic spirit in schools to aid recovery.” Explicit statements equating the “Olympic spirit” with that of “the spirit of conquering disaster” or endurance and forbearance were made. In many ways this strategy worked. Following decades of famine, war, foreign occupation and revolutionary excess, hosting the Olympic Games was seen by significant numbers of Chinese as the moment when their country could finally hold its head up high to receive gold medal after medal. Various short-term inconveniences were put up with without much protest including electricity shortages in neighboring provinces, temporary economic losses suffered by businesses ordered shut during the Games, the clearing away of brothels and other “unsuitable” venues, and so on. The idea that certain sacrifices were both necessary and worthwhile achieved a degree of popular currency. These “adjustments” included fundamental changes such as the creation of a capital city in which many long-term residents found themselves symbolically and physically cast out to the fringes. New Beijing did not have space or patience for poverty. As the Olympics euphoria comes to an end, bringing with it closure to the seven-year-long hype around the event, both short- and long-term contradictions swept under the carpet of the Games will find themselves rudely uncovered. 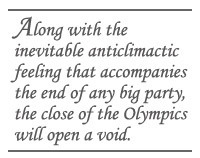 Along with the inevitable anticlimactic feeling that accompanies the end of any big party, the close of the Olympics will open a void. From environmental degradation to the country’s badly tattered social-security fabric, the challenges confronting China today are hard ones for authorities to fit into the nationalistic discourse the Games had laced so well with. An aging demographic, health-care reform, inflation and corruption are issues that will become easier to hear without the overwhelming noise generated by the clarion call of the Olympics. As a long-term resident of Beijing, the end of the Games has left even me with a sense of hollowness. After weeks of yelling “Zhongguo Jia You,” or Come on! China, as Chinese athletes won medal upon medal, there’s a desire to continue cheering, but no victories to cheer for. I’m left wondering what will unite the country in the absence of the Games. What will distract from internal divisions and emergent tensions? Historically sporting spectacles have only been matched by small wars as diversionary tactics. The likelihood of China taking that course in the near future is minute. Nonetheless, the next few years will be crucial in determining how fragile or resilient the current regime in China really is. Faced with rising labor costs, an economy that is increasingly intertwined with the outside world, and growing pressure on resources from water to oil, China will need to devise new strategies to transform its economic model, if it is to continue to grow at the double-digit rate of the last decade. With the end of the Games, Olympianism’s greatest failure – its overwhelming emphasis on unity to the exclusion of legitimate differences – will also no longer be as easy to obfuscate. Discontentment against Beijing’s rule in Tibet and Xinjiang which took centre-stage for a while in the run up to the Olympics will re-emerge as formidable challenges for the authorities. Without the Games and their prestige to drive home the necessity of “harmony” at any cost, China’s ruling party will have to confront its greatest Achilles heel – its inability to admit to the existence of real diversity and dissent – head on. For years now the Olympics have acted as a safety net for the juggling act China’s ruling party is constantly engaged in. 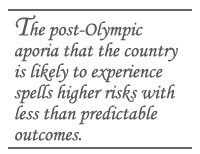 The post-Olympic aporia that the country is likely to experience spells higher risks with less than predictable outcomes. Expect some furrowed brows in Zhongnanhai.